One of the most important aspects of social interaction is smiling, showing others we’re confident and outgoing. Â Many people, though, are hesitant to use this important social skill because their teeth are unattractive. But even the most unattractive teeth can be dramatically transformed through cosmetic dentistry. Here are 5 prominent ways we can restore beauty to your problem teeth. Enamel shaping. Sometimes teeth can have an irregular shape that makes them stand out like a sore thumb. With this “sculpting” technique, we remove very small amounts of enamel, the outer protective layer of a tooth, which improves the tooth’s overall shape without harming it. Bonding. Recent developments in acrylics now make it easier to repair chipped, broken or decayed teeth with minimal preparation. The acrylic material can be molded to resemble a natural tooth and colored to precisely match its shade and that of neighboring teeth. It’s then bonded to the tooth with a durability that can last through years of daily biting and chewing. Veneers. These thin layers of dental porcelain are bonded to teeth to cover minor defects. Otherwise healthy teeth that are slightly chipped, stained or a bit out of alignment can get a more attractive “face” that’s durable and lasting. Crowns and Bridgework. Sometimes teeth are too heavily decayed or lost altogether to use bonding or veneers. With porcelain dental restorations that have a strong inner core and an outer life-like appearance, we can completely cover an individual damaged tooth with a custom-made crown or replace one or more missing teeth with fixed bridgework. Dental Implants. Introduced over thirty years ago, implants are a popular tooth replacement choice. Â Its inner titanium post is surgically inserted into the jaw where bone cells grow and adhere to it to form a strong, lasting bond. Implants can be used for single teeth or as supports for fixed bridgework or removable dentures. 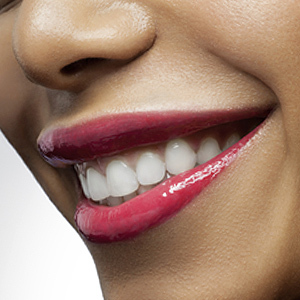 Regardless of your teeth’s appearance problems, cosmetic dentistry has a solution. The first step is a comprehensive examination — from there we can advise you on the best options for turning your embarrassing smile into a more beautiful and confident one. If you've ever looked through a magazine and viewed the perfectly aligned white smiles of celebrities and models, you may be already familiar with the look of porcelain veneers. To achieve a picture-perfect smile, many Hollywood stars choose porcelain veneers (thin-layers of porcelain) that are bonded to the front of teeth allowing for the alteration of tooth position, shape, size and color. By fixing imperfections, as well as whitening them, veneers offer celebrities a perfect smile that, when maintained properly, can last for several decades. Evaluation: If porcelain veneers sound appealing, our office can help you decide if you're a good candidate for them. We will ensure you have sufficient tooth structure, that your teeth are in more or less a normal position, and that symmetrical gum contours are present, allowing for proper “framing” of the teeth, necessary for a beautiful smile. The Process: Once it's been determined that you're a good candidate for veneers, our office will begin a smile analysis using computer imaging to digitally replicate your smile and then fabricate a mock-up smile made of tooth-colored wax. We will work with you to determine the right color and shade for your veneers. You can choose the brightest, whitest “Hollywood smile” or opt for a more natural color and enhanced look. Next Steps: After your initial appointment, it typically takes the laboratory one week to fabricate your porcelain veneers. The insertion of your veneers can be done with or without a local anesthetic. We will place the veneers on your teeth with a light-sensitive resin, which sets with the use of a white light, effectively bonding them to your teeth. While you may initially experience some tooth sensitivity to hot or cold, this will disappear after a few days. Maintaining your perfect smile requires simple brushing and flossing techniques and routine check ups. Porcelain laminate veneers are one of the innovative techniques dentistry has developed for restoring teeth to improve their color and shape so that they look as good as or better than the originals. What are porcelain veneers? Porcelain is a ceramic material that is baked in a high-heat oven until it becomes glass-like. Your grandmother's antique china teacups are probably made of porcelain. Dental porcelains are especially made to perfectly mimic the color, reflectivity and translucency of natural tooth enamel. A veneer is a covering or shell, a false front; dental porcelains can be fashioned into veneers used to restore the enamel surfaces of teeth. What is a laminate? A laminate is a structure created by uniting two or more layers of material together. Dental porcelain laminate veneers refer to the combination of tooth enamel bonding material and porcelain veneer. When are porcelain laminate veneers used? Porcelain veneers are used to enhance the color of stained, darkened, decayed and heavily restored teeth. They are also used to: correct spaces between teeth; straighten slightly rotated teeth; correct problems in tooth shape and some bite problems. They can be good solutions for broken teeth or teeth that have been worn by habitual tooth grinding. What is the process of placing the veneers? Room generally needs to be created to place a veneer; generally requiring about half a millimeter of reduction of tooth enamel. Artistic dental laboratory technicians fabricate veneers. About a week of laboratory time is usually needed to construct your veneers. How do I know whether I will like the way my new veneers look? Computer imaging can be used to digitally replicate your teeth and create images of the proposed changes. Models of your teeth can be cast and changes can be made in white wax for your preview. Temporary veneers can also be fabricated as a test drive before the final veneers are fabricated. How long will porcelain veneers last? Veneers can last 20 years or more. They are very strong but like glass, they can break if extreme force is applied to them. You should avoid such activities as opening bottles, cracking nuts, or biting into candy apples with your veneers. How do I look after my new veneers? Once the veneers are placed, you should continue daily brushing and flossing. There is no higher incidence of decay around them than with your natural teeth. However, the more dental work you have in your mouth, the more vigilant you need to be. Of course, keeping your sugar consumption low helps to protect all of your teeth from decay. Imagine how different things would have been for movie star James Dean, had he not managed to replace the front teeth he lost as a youngster. According to one biography of the 1950s heartthrob, Dean's teeth were knocked out while he was swinging around on a homemade trapeze. Because his smile was restored, Dean was able to land the plumb movie roles that catapulted him to stardom. This is perhaps the ultimate example of how a smile makeover can create new opportunities for a person. But opinion polls confirm that nearly 90% of adults feel an attractive smile is an important social and career asset. And, an almost equal percentage of adults feel that their smile could use some improvement. Do you avoid smiling in photos? Are you conscious about spaces and gaps in your teeth? Are your teeth making you look older than you feel? Have you held back a smile? Do you feel that your teeth are stained or too yellow? Do you hold your hand up in front of your mouth when speaking or laughing? Do you notice areas of excessive tooth wear that make your smile look older? Do you have little teeth and a gummy smile? Are your teeth crooked, chipped or crowded? Do you wish you had someone else's smile? If you answered “yes” to any of these questions, please come in and see us. We have an amazing array of cosmetic procedures available to us — far more than what was available to James Dean in the 1950s. These options range from relatively inexpensive teeth whitening treatments to more permanent cosmetic solutions such as porcelain crowns and veneers. Together we can come up with a plan to give you the smile you've always dreamed about. For a bride, there is so much to remember when planning the wedding — invitations, a dress, flowers, the site, the caterers, the cake, the photographer — the list goes on and on. In the midst of all these things, don't let a very important piece of the plan be forgotten — your smile! Your wedding will be celebrated every year on your anniversary and commemorated in beautiful photos at any time. It is a special occasion you, your family, and your friends will always remember. But how will you and your family look in those photos? You have an opportunity to get makeovers that will make your smiles shine radiantly, and not only in your album. Your makeover will improve your appearance, your self-confidence, and your oral health far into the future. Start with a visit to your dentist to assess your current situation and discuss your goals and dreams. Each person's situation will be different. At a minimum you may need a professional cleaning to make sure that your teeth and gums are healthy. Get started on treating any cavities or gingivitis (gum inflammation). If you haven't already, now is a great time to establish healthy dental hygiene habits including proper daily brushing and flossing. You may feel that your teeth are discolored and need to be whiter and brighter. Your upper and lower jaws may not meet properly for the most effective biting and chewing. Your teeth may be crowded or misshapen. All these things and more can be modified and repaired with today's dentistry. Teeth can be whitened by bleaching in the dentist's office or with products that can be used at home under a dentist's supervision. Orthodontia may be needed to repair your bite. Today orthodontia may be done either with traditional braces, or with clear aligners. Remember that this process works slowly, so start well in advance of your wedding day. After your teeth are properly aligned, your dental team can work on subtle contouring, overall shape and color changes for individual teeth, using techniques such as porcelain laminate veneers. Temporary veneers can be made so that you can try out your new look before the final installation. Wedding planning works best when started early. To make sure you, your new spouse, and your family look and feel their best, remember to include smile makeovers in your plan. When Is a Dental Crown Needed? When Are Dental Crowns Used? What Are Some Common Cosmetic Dentistry Procedures? Get a Spring Tooth Cleaning! Why Do Dental Veneers Resist Staining?